Granada, 니카라구아의 카사 델 아구아 | 호스텔월드에서 예약하세요. All guests have full access to an open kitchen, dining and lounge and porch areas where you can enjoy the camaraderie and great advice of other guests. Also included is a continental breakfast, free coffee, tea, filtered water and bike rental all day! Exploring Granada's beautiful colonial city is easy to do since our location is right in the heart of town. 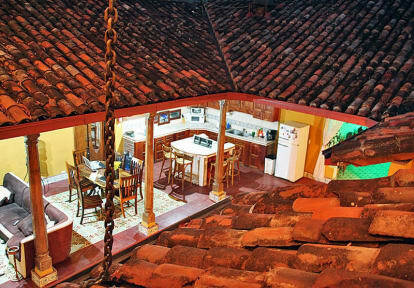 Explore the many great restaurants and eateries that has made Granada the food capital of Nicaragua. And when the sun is at it's highest, the feet are tired, escape by dipping into our 2 crystal clear pools. We offer great and unique tours, such as Bella del Mar Isleta tour and 'Mombacho's secret' chocolate tour, along with everyones favorites, Masaya Volacno night tour and Laguna de Apoyo day trips. Our motto: Casa del Agua is just like home, only better.